Cherry Topped Sweet Biscuit Sandwich Recipe is an easy and healthy snacks box recipe for kids. This recipe is a combination of Nutrichoice biscuits, peanut butter, chocolate sauce, and cherry. My daughter participated in another edition of “cooking without fire”, in her school the last week. This was the 2nd edition of this competition. In fact, she has secured the first position the last year. This year, the topic was “biscuit craft competition”. The winners were to be decided on the pattern of arrangement, presentation and the nutritional value of the recipe. What she made for the competition was interesting. And that’s why I thought I will use that for this week’s recipe. This recipe is a good lunch box recipe and kids will absolutely love it. But before I get into the recipe, I just wanted to share something that I experienced as I was prepping her up for the competition. When she came to me saying that there was this competition at school, the first statement of hers was, “Mom, I want to be the first this year as well”. But soon I noticed that she was under some kind of a pressure. She would be very specific about things and wasn’t really ready to try out anything. She would get irritated if something didn’t go as per plan. And during all of this, she would keep asking if she will be able to win the first prize. And I realized the amount of pressure she was in. It wasn’t the pressure of winning the first prize. Instead, it was the pressure of the expectations. Her worry was more about what everybody will think of her if she doesn’t win the first prize rather than winning the prize itself. I slowly also realized that this pressure wasn’t really getting the best out of her. So I took her aside one day and the two of us lied down on the bed, I asked her about what will happen if she doesn’t win the first prize. I took her into my arms and then spent the next 30 minutes telling her how it didn’t really matter if she won or, not and that what was important was to participate. I replied, “Yes, I will be happy. Happy because you worked hard. Happy because you participated. Happy because you tried”. The next day, I saw a different girl. She came up with so many ideas. 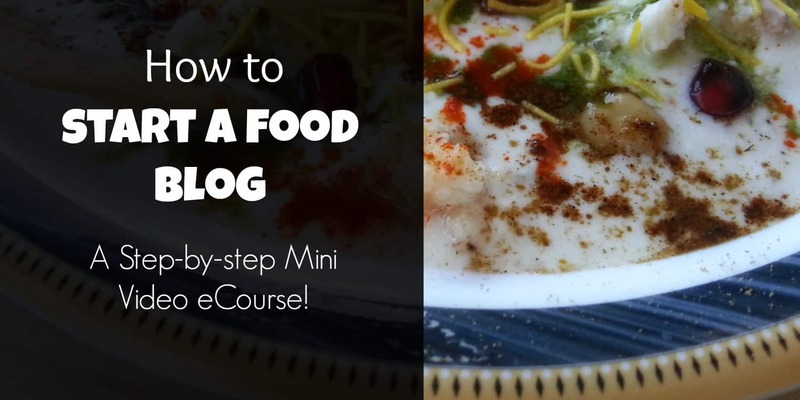 And finally, this simple little recipe was what she decided to go with.. The best part is that the arrangement and the presentation was also her idea. I was surprised at how productive and efficient an open mind without pressure can be. In fact t,his is something that a lot of school going kids in India need. We are unknowingly putting so much pressure on performance on our kids that they are succumbing to this pressure. But what we are not understanding is that it doesn’t really matter if they are first in their class or, not. What is important is if they are understanding the concepts or, not? And as a parent it is our responsibility to talk to them and tell them that they are under no pressure. That is the most effective way to ease the pressure that they are in. So, on that note, let us jump into the recipe. 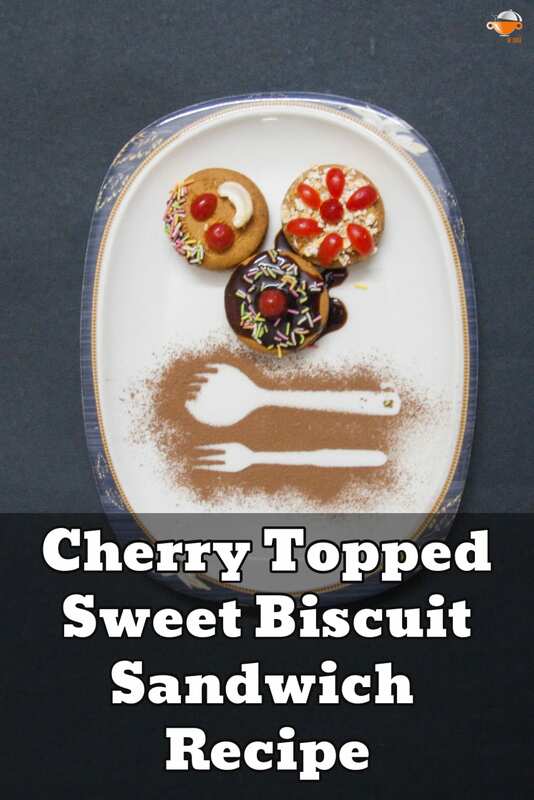 Cherry Topped Sweet Biscuit Sandwich Recipe is made with Britannia Nutri Choice Hi Fibre Digestive Biscuit, layered with peanut butter and chocolate sauce, decorated with oats, cherry, and some sprinkles. Cherry Topped Sweet Biscuit Sandwich Recipe is the best recipe to kick-start your day with. This healthy snack recipe improves your energy and strength with the power pack dose of high fiber and protein. Cherry Topped Sweet Biscuit Sandwich Recipe is an easy and healthy snacks box recipe for kids. Take a Nutrichoice biscuit and spread peanut butter on it. In a second layer spread chocolate syrup on top of the peanut butter. Place another biscuit on top. Garnish it with oats or sprinkles. You can make it look like a smiley by decorating it with cherries. The three pieces here have been decorated to look like Smiley, Flower and Little Donuts. A lot of time, effort and passion goes into each post. My greatest satisfaction comes from your feedback. If you really liked this post and found helpful to you, please take a minute of your time to leave a comment and share it so that others have access to it as well. Thank you all for your support.